The impact of these challenges is that personnel are constantly on the “hamster wheel,” struggling to get ahead and lacking the ability to be proactive. With so many volunteers and staff members coming and going, tacit knowledge is often lost with their departures, making it difficult for new personnel to pick up where they left off. Finally, any attempt to implement new technology is often met with resistance, since staff members may not be tech-savvy, and high turnover means constant training and adoption support. Let’s explore eight ways a CRM can amplify your nonprofit organization’s efforts, so you can spend more time doing good work and less time doing busy work. Your nonprofit interacts with a variety of people, such as donors, volunteers, beneficiaries, people who attend events, board members, corporate sponsors, celebrity supporters, social influencers, and staff. Sometimes constituents may fall into multiple categories, like the dedicated volunteer who was once a beneficiary who now donates monthly and attends every local event. Managing all of these people can be a messy, especially if your nonprofit is operating old school—that is, using multiple, independent spreadsheets or even paper files. Take a look for yourself at the following Excel sheet (used by the YMCA to track donors), and then compare it to Copper’s People view directly below it. Both will collect the same information, but only one has the capability to supercharge your donation efforts… we’ll let you guess which one! Don’t look too long—you’ll strain your eyes! A CRM will consolidate all information and communications pertaining to each of these individuals and groups of individuals, including internal notes, donation amount and frequency, membership history, events attended, and more. This single source of truth will empower your team to be more strategic and proactive about your outreach and follow-up. 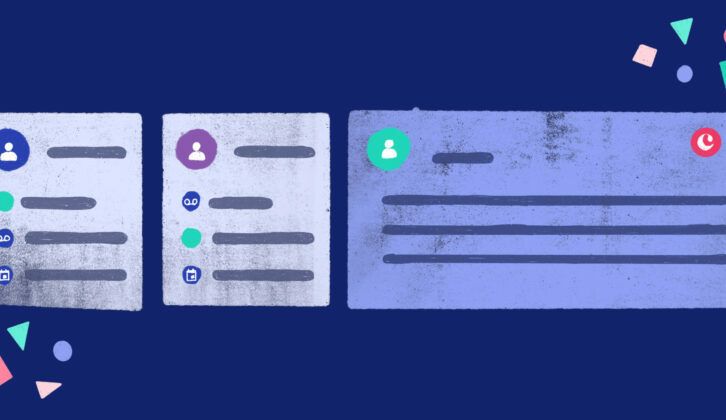 You’ll be able create custom lists of contacts based on whatever criteria you define, like people who’ve not been contacted in X months or people who donated to a specific campaign. Pro-tip: Learn about other tasks your CRM can do for your nonprofit with this free guide. Donors are the lifeblood of your organization… or maybe that’s volunteers. In any case, donors are essential to any nonprofit’s survival, and a CRM customized to your organization’s needs and workflows will help your team communicate with donors more efficiently, ultimately multiplying your fundraising efforts. Track if an email you sent has been opened or not. Set reminders—such as follow-up reminders, repeat donor reminders, annual campaigning reminders—so that no one falls through the cracks. Maintain and customize different pipelines for different groups, like potential donors (leads), current donors, and lapsed donors. Log all notes from conversations with contacts, so all personnel have the same context, even if they haven’t spoken with the contact firsthand. Online banking has quickly become the easiest, most convenient way to bank, allowing people to pay bills, transfer money to their friends, set up automatic payments, and more. In fact, according to a recent survey, two-thirds of Americans now use digital banking (either desktop or mobile) as their primary banking channel. More and more of us are handling our finances online. Nonprofit organizations need to keep up with the times, enabling donors (and potential donors) to contribute to their causes with the same ease and convenience. A good nonprofit CRM will allow you to do this, linking fundraising tools (like Donately) directly with your CRM and automatically logging and tracking donations for easier reporting and projections. 4. Customize and personalize donor messaging. Nonprofits aren’t exempt from these statistics, and yet archaic processes for donor communications are preventing organizations from personalizing their messages efficiently. A CRM tracks a variety of information, which can be infused into your comms and marketing materials to create a personalized experience at scale. Take a peek at this email from charity: water which includes key donor information, such as the name of the campaign they contributed to, the amount donated, and the country the donation went to. Which email would you be more interested in—the above example or a generic one? These details make donors feel personally invested in the work the nonprofit is doing, and including specifics about what exactly the donation is contributing to reduces the risk of donor fatigue. 5. Provide a collaborative and secure workspace. High turnover is a common challenge among nonprofits, with rates as high as 19% reported in 2014 and 2015. It’s not a challenge that can be easily overcome, but the negative effects of high turnover—loss of tacit knowledge and threat to security—can be overcome with a CRM. Loss of tacit knowledge—the accumulation of a person’s experiences, stories and solutions—can be a huge drain on your nonprofit if not transformed to explicit knowledge. The importance of explicit knowledge is that it’s easily accessible to and understood by anyone, so no matter who is accessing the information, everyone has the context they need to do their best work. Not only that, consolidating all your information in a trusted CRM allows you to manage exactly who gets access to what and when—meaning your constituents’ personal information is kept secure. 6. Establish easy-to-adopt automated processes. However, if your nonprofit has high turnover and a lack of tech-savviness among some staff and volunteers, it can be hard to wrap your brain around implementing a fancy new CRM. But not all CRMs have significant barriers to adoption. In fact, some operate directly within the tools you’re already using, so there’s minimal formal training required when new personnel come aboard. The team at Love Your Melon, for example, was already familiar with G Suite, so they chose Copper—trusted and recommended by Google. Read about the results Love Your Melon saw after implementing a CRM. A good CRM should help your team establish and uphold repeatable processes within your organization, creating efficiencies at every operational stage. Not only that, it should also be flexible enough to be customized to suit your team’s existing workflows and integrate with your existing tools, so disruption is kept to a minimum and onboarding is seamless. For many nonprofits, events represent a significant portion of their fundraising efforts. Events might include gala dinners, silent auctions, golf tournaments, walks/runs, variety shows, carnivals, and much, much more. In addition to generating significant one-time donations, events can also attract members and volunteers alike, so effectively managing your nonprofit’s events can hugely impact the future of your organization. A CRM for nonprofits should integrate with whatever event registration platform you’re using, automatically track revenue, add new contacts to your database, and update existing contacts at registration. If your CRM doesn’t natively integrate with your event registration platform, a webhook tool like Zapier can easily help connect the dots. 8. Quickly generate lists, reports, and projections. Perhaps one of the most important benefits of using a robust CRM for nonprofits is the sheer amount of data at your fingertips. Whereas before you may have lacked insight into where your revenue is coming from and where you’re leaving money on the table, now you’ll be able to identify high-value opportunities, accurately analyze the effectiveness of your initiatives, and report on how you’re tracking to meet your goals. For example, maybe after digging into the data you discover that people who attended last year’s holiday gala were 50% more likely to commit to monthly donations of at least $100 if contacted within two weeks of the event. This gives you time to plan a follow-up campaign for next year’s event, targeting those who attend the event with a request for monthly donations of $100. Do good; do good work. Nonprofits around the world are doing important work every day. But due to many common challenges such as a lack of resources, high turnover, and no repeatable processes, the amount of effort put in often doesn’t result in the high return it should. By implementing a flexible CRM, your nonprofit can move away from busy work and focus its efforts on the high-impact initiatives that change lives and build community relationships. You know your nonprofit could benefit from a CRM—but do you know what features you need? Here's what nonprofits should look for in a CRM.